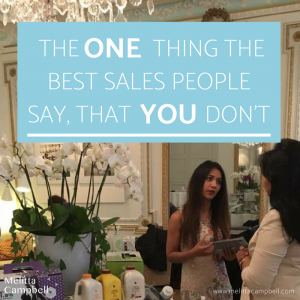 If you've been looking to improve sales with a secret sauce that can help you sell more without coming across as salesy, here it is! It comes from starting every conversation with a new contact or prospective client just like the best salespeople do - with a great answer to the question: “What do you do?”. If you are like most people, you would probably tell them a bit about your past successes. Or perhaps how you got to where you are today, and what your current job title or situation is. 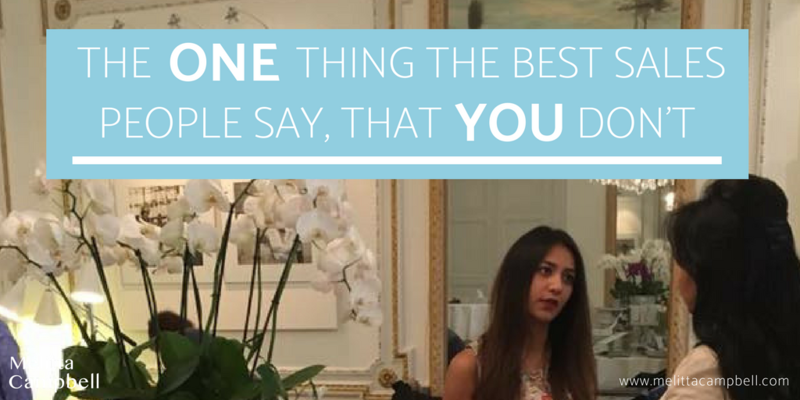 If you’re like most business owners, you may well share with them what’s great about your company and how long you’ve been in business, before going on tell them about your unique set of products or services and how amazing they are. These are of course all legitimate answers but they are not very engaging, nor do they tell the person what they really want to know. The best salespeople, however, answer the real question being asked! In asking 'What do you do?' the person is really asking 'What are the benefits of working with you?'. Sales expert, and author of one of my favourite books on sales and communication, The Jelly Effect: How to Make Your Communication Stick , Andy Bounds, calls this the ‘Afters’; how the person’s life or business will be better After working with you or buying from you. Knowing this will allow you to create a very different, and far more engaging answer to this question. It's likely to gain follow up questions that will take you much closer to some interesting sales and referrals too. Theodore Levitt, the celebrated economist, Harvard Business School professor and author of the classic Marketing text Marketing Imagination, gave a great example. He famously explained that people don’t buy a ¼ inch drill because they want a ¼ inch drill; they buy it because they want a ¼ inch hole! Don’t sell drills, sell holes! If you are a Tax Advisor – you’d sell how you help your clients have less stress and pay less tax. If you are a personal trainer – you’d sell that feeling of having a strong, fit body, not the boot camp they will have to endure for months first. Airlines do this when they sell stunning locations and memorable holidays - when what they are actually selling are hours of queues and sitting in cramped seats inside a metal tube! Another sales expert I've had the privilege of working with is Phil M. Jones, author of Exactly What to Say: The Magic Words for Influence and Impact . In this book, he shares some amazing Magic Words that you can weave easily into your conversations to gain more sales. One of these words is 'Most People', explaining that most people like to be like Most People, this tells their subconscious mind that you are in fact talking about them. Doesn’t that sound more exciting than: 'Home Business Success Coach'? Or even my longer response: “I’ve been working in communication, marketing and leadership for more than 25 years. Then three years ago I set up my own wellness business, which has enabled me to bring all this experience together. Today I enjoy helping people around the world start their own thriving business in my industry.” Accurate, but a bit on the dull side. Do you see how it answers the question, but in a way that is clear, engaging and prompts the person to follow up with questions about 'How'? The more you know about your audience, the more you can offer ‘After’s’ that will appeal to them. The best ways find out more about them are to do your homework and to ask! Use a few questions to find out more about what they are looking to achieve, what their objectives are, what keeps them up at night, how they would like the future to be different and so on. You’re trying to uncover problems they have that you can help with. You may find that you can do some research ahead of time to reveal some potential pain points; social media is a great resource for this. The most logical follow-on to this style of response is a question (probably several) about How you offer this solution. This gives you permission to talk more about your company, products and solutions. Make sure you are prepared for this with lots of short, simple and engaging points that you offer one by one. This will allow the questioner to lead you. The best way to share your ‘How’ is by sharing stories of how you’ve helped people with similar ambitions or situations to your questioner. People are always happy to listen to stories and they usually remember them too. Stories are engaging and a wonderful way of differentiating yourself from the competition, since most people simply share facts and dry information. Finally, finish with an invitation to discuss how you can help them in the future. This is when you’ll start to map out with them how you can get them from where they are now, to where they want to be in the future. If it’s not appropriate to discuss this at the time of the conversation, arrange a time to meet over coffee or more formally in the coming week. So there it is - your secret sauce! Tried these tips? What works for you? I'd love to hear your 'afters'! Share your tips and experiences in the comments below! Love this advice! My father was a very successful salesman. His advice was very similar. You have to believe in the product you are selling. If you don’t believe your product will really solve someone’s problem you’re wasting your time and theirs. Your father had some very wise words – thanks for sharing Rebecca. Sells is something a lot of people struggle with. And sometimes just having the confidence to be able to sell is a huge obstacle. Thank you for your pointers and referencing material! Selling was something I was scared of at first because I was thinking about it all wrong. Truth is, most of us love being sold to when that means that we get clear information, great service and can make a purchase confident that it’s the right thing for us – but when we think of sales, we tend to think of dodgy second-hand car salesmen. Glad you found the post helpful. Awesome post, definitely we should know that and i just learned something today as i’m not a seller. Great post! I often think that being able to sell is a key life skill – we have to sell ourselves and ideas all the time and the techniques that salespeople use can be really helpful in all aspects of life. Glad you enjoyed the post Frank. So pleased you found it helpful Jeanie, thanks! I have never been able to be a good sales person…I guess the confidence just inst there for me. This is a great read with some wonderful tips….Thankyou!!! I think once you switch from thinking about making a sale, to making a new friend and supporting them with great service, it becomes much easier. Glad you enjoyed the post Amberly, thanks for your comment. I do agree with all the ideas you’ve presented in your post. They’re very convincing and will certainly work. Still, the posts are too short for beginners. Could you please extend them a little from next time? Thanks for the post. Thanks for your comments Kent. Glad you enjoyed the post. It’s always tricky to get the balance of ‘not enough’ versus ‘too many’ words, however, bare with me, my intention is to share complementary posts that expand on all the ideas I share over time, as well as creating more eBooks with additional detail. Watch this space! The books I’ve shared in this post are also excellent for beginners wanting more information. Glad you enjoyed it Deborah and thanks for sharing it with your group! These are great things to say to people I reach out to- saving for later! I am a health coach and can totally relate to a lot of these words and questions. Thanks Collette, so glad you’ve enjoyed this – and I think you’re right, this is a great way to connect with anyone in any situation. I believe that good sales skills are in fact simply good life skills.